A spicy addition to any gathering, Hoffy Franks add just the right bite to these poppers. Make a slit vertically down one edge of the jalapeños. With a paring knife and small spoon clean out the jalapeños of seeds and pith. Do not touch face or eyes while cleaning the peppers. Wash hands afterward. For batter combine dry ingredients in medium bowl and stir so fully mixed. Combine eggs and beer, pour over dry ingredients and stir to combine. Let it sit while you prepare the poppers. Cut hot dogs in half lengthwise, and each half, again in half lengthwise. Cut hot dog quarters into lengths to fit into jalapeños. 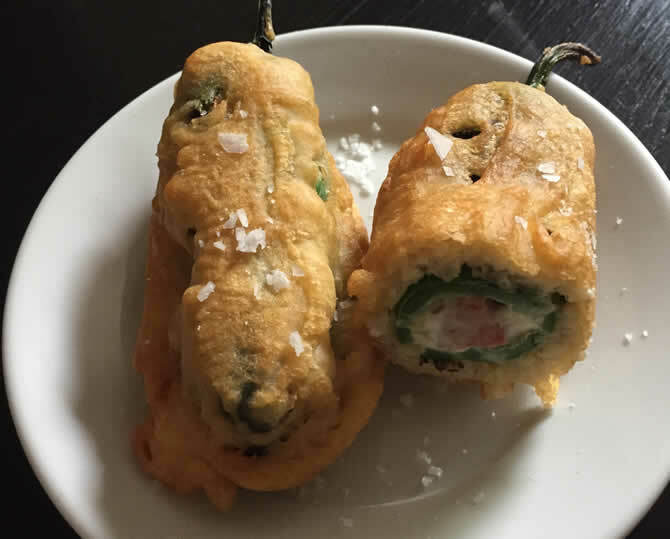 Place one piece in the center of each jalapeño and fill with cream cheese. Place jalapeños over fire of gas stove to char turning until browned lightly on each side. (If you don't have a gas stove, place jalapeños on a baking sheet under the broiler turning once until lightly charred.) place toothpick in each jalapeño to keep slit closed. Heat 2 to 3 inches of oil in a pan over medium high heat. Dredge jalapeños in cornstarch and holding the stem dip in the batter. Carefully remove from the batter and shake off the excess. Drop in oil and fry about 3 to 4 minutes or until golden brown. Sprinkle with salt and serve with lime wedges.